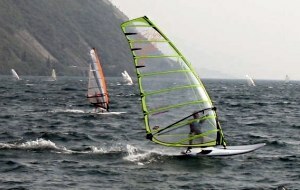 Windsurfing is available at countless beach resorts and lakes more or less everywhere. Some places however have a reputation for reliable and plentiful wind, and here is where you'll find a concentration of equipment outfitters, windsurf schools and so on. 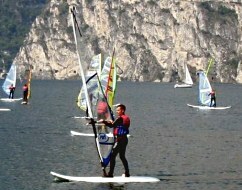 One such place is Lake Garda (Lago di Garda) in Italy, so we took a beginners' package with all the equipment and lessons included. Firstly, an introduction to the equipment. First up is the wetsuit, preferably including neoprene socks both for warmth and grip. The lifejacket is also a must, and then you just need your waterproof suncream and a (strong) cord to hold your glasses (if you need them). Next comes the board, and hopefully they have some nice, big, wide, stable floaty boards for beginners. Looking like a fat surfboard, there's a small fin poking out from under the tail, and a joint in the middle of the top for attaching the mast, and that's about it. The expert ones will probably have footstraps (as well as being smaller, narrower and less floaty), and the beginner ones may also have a retractable dagger board underneath the middle. Finally, the sail. Roughly triangular in shape, with a tall mast and a curved bar on each side (the boom) to hold onto. The sails obviously come in a variety of sizes, with beginners' ones being generally smaller for less power. The choice of sail also depends on the board and on the current wind strength - our group was kitted out with 3.5 and 4.5 square metre sails for our first go. Just like with the land yachting, the very first lesson keeps it simple by removing the sail. In a sheltered area with a light wind, we just practiced standing in the correct position on the board, and keeping our balance on the waves. With one foot next to the mast socket and the other foot in front of the daggerboard, the wind on our backs was enough to blow us gently along, while we got the feeling for how the board tips and rolls. A few goes of this (while alternating the feet) and we were ready for a bit more power. Before letting us loose on the water, we first had some instruction on land on a practice board. An important thing to learn is the neutral position, where you're ready to start moving but there's no wind force on the sail. In this position the nose of the board faces across the wind, you stand with feet either side of the mast with your back to the wind, and hold the mast so that the sail points directly downwind. This is where you try to get to after hauling yourself and the sail back out of the water each time, and from here you can turn the board the way you want to go and then manoeuvre yourself into the sailing position. It's easiest to get going at right angles to the wind direction, that is across the wind. So the first goal is to go across the wind one way (preferably without falling in), stop, turn around (preferably without falling in) and then come back across the wind. Easier said than done, and suprisingly the not-falling-in part was more difficult when stopped and turning round than when going. The next lessons introduce a bit of steering to the equation, by changing the position of the sail to head more upwind or more downwind. It requires a bit of experimentation to find the range of angles where you can get wind power, as if you head too far upwind, the sail will stop pulling you and you'll take a swim. You also need to keep a constant eye on the wind direction as a changing wind can prove very confusing! Use the flags on the shore as a guide, and check it from the neutral position - when you hold the mast the sail will show you which way is downwind. A common pattern seems to be that the waves on the lake build up during the day - so for beginners it's better to get out there early when it's a bit easier to keep your balance. It's a self-reinforcing thing, the waves help make you fall in, you get more tired because you're having to lift yourself and the sail out of the water more often, and the tiredness contributes to the falling in. As with many of the activities here, there's a hill to climb before it gets easier and more effortless. 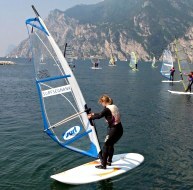 Windsurfing benefits from a huge popularity, and this stimulates the growth of the schools. 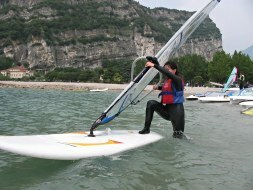 The variety of equipment on offer for rent means that riders can experiment with different boards and sails for different conditions rather than owning an arsenal of gear. And the instruction is not just geared to beginners, there are lessons for advanced techniques including using belt harnesses, gliding (going fast enough for the board to 'plane' over the top of the water), using footstraps and so on. So the culture is very much of continued progression, with plenty to learn and a good social scene in which to learn it. 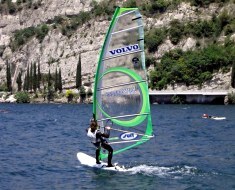 We tried it out at a small, quiet location in Southern England (windsurfing-chichester.co.uk), and also at a lively and renowned resort on Lake Garda in Italy (surfsegnana.it). Both places we found to be friendly and professional, but for sheer scale, atmosphere and scene, Lake Garda is pretty hard to beat. There's a complete range of skills and abilities taking part, from the raw beginner to the fully-laid-out fliers, and the package deals are good value. Page last updated June 2004. Feedback welcome at mail@activityworkshop.net.